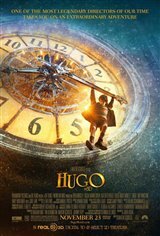 Hugo Cabret (Asa Butterfield), an orphan boy living in the walls of a Paris train station, meets a girl (Chloë Moretz) who possesses the key to a machine left behind by the father he recently lost. With her help, he searches for the answer to a mystery linking a bitter old toy shop owner, a hidden message from his dead father and a mechanical man. Based on Brian Selznick's award-winning New York Times bestseller, "The Invention of Hugo Cabret."